There is an alternate version of this Still Life Image. I have never posted it on my website. Unfortunately vintage dolls do not look as good in colour. Once they are in colour, they lose that timeless quality, the aged, old western, look. 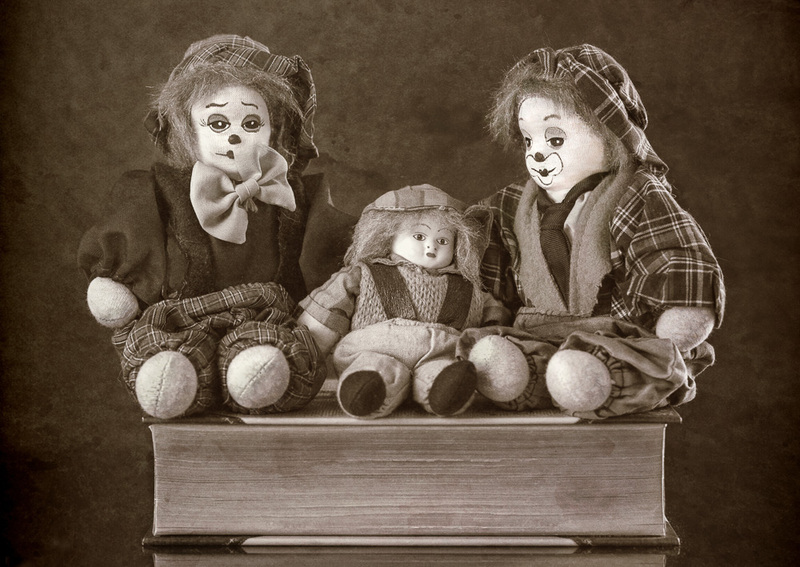 If you want your vintage dolls to look like they came straight out of Bagpuss, then black and white post processing, is the key. (For those who do not know, Bagpuss is a 70’s BBC children's TV show about a worn, scrappy, fluffy, toy cat who lives in a shop in which he and other old fashioned toys come to life, in glorious stop motion.) Yes I know it was in colour, but it was so antiquated and vintage in it's style and props, that it had that complete, timeless quality that I am writing about. This colour version loses the antiquated look and feeling, that the B&W version has in droves. It has the feel of modernity, like I recently bought those toys from a charity shop. However you may disagree with me, that is fine. Could I have processed the colour photo differently, to give it more of the drab 70’s wallpaper colour palette? Of course, but I do not think it would have been as effective as the black and white post processing that you see above. However you may disagree with me, that is fine. To me, the B&W image looks like the image has been found. A discarded photo from a 1930s child's scrapbook. Like it could be found on a board from the wonderful Pinterest, when you type the keywords: ‘Vintage Dolls,’ into the search bar. There are many ways to edit an image, that contains a landscape, street photography, sports, portraits and still life, but when it comes to vintage, spooky looking toys, if you want that 'we thought this image was lost a century ago’, look, black and white photography is the answer.